Just a thought from 8 July 2003 about Photos. 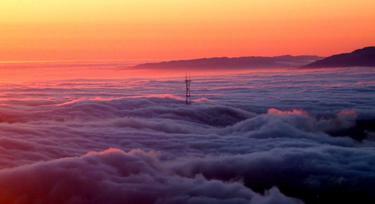 Our flight to Vancouver treated us to a stupendous sunset over a blanket of fog around Sutro Tower. Update: 'Cause someone asked, here's a 1024x768 version suitable for desktopping! This section is called Just a Thought. It's a blog where I post little pieces of what I'm thinking about at the moment. This page is an individual entry called “Sutro sunset” that I wrote on 8 July 2003. Before this, I wrote a little something called “The internet is what we make it” on 8 July 2003. After this, I wrote “Upcoming SF Event: The Canvas” on 9 July 2003.